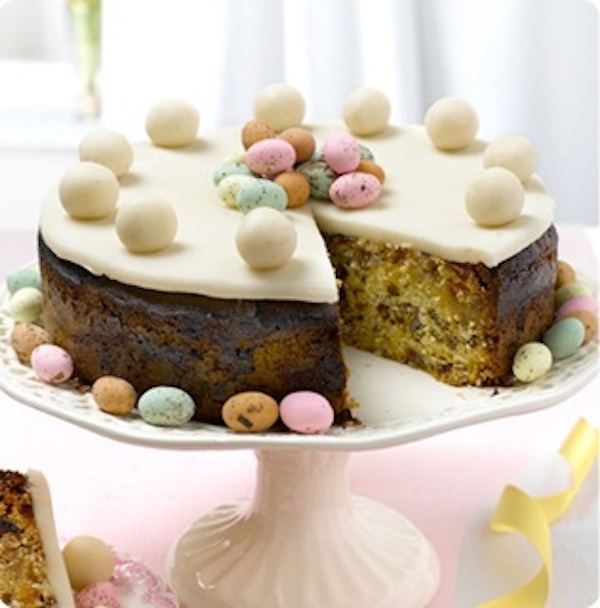 This Easter Day cake by Linda Collister, is made from a light fruit-cake mixture with dark chocolate. There is a layer of marzipan in the middle of the cake and another layer on the top after baking. The cake is traditionally decorated with eleven balls of marzipan to represent the Apostles. The chocolate eggs and pretty ribbon are a lovely addition. 2 Heat the oven to 180C/350F/Gas4. and set aside until needed. or an electric whisk or mixer. the ground almonds with the last egg. 8 Roll-out one third of the marzipan to a circle slightly smaller than the tin. 9 Set in on top of the cake the cover with the rest of the cake mixture. 10 Spread it evenly then make a slight hollow in the centre so the cake rises evenly. in to the centre of the cake, just down to the marzipan layer, comes out clean. 12 Leave to cool on a wire rack then remove from the tin and discard the lining paper. 13 Roll out two-thirds of the remaining marzipan to a circle to fit the top of the cake. 15 Shape the rest of the marzipan into 11 balls and arrange around the edge. 16 Fill the centre with miniature Easter eggs and finish wit ha ribbon around the cake. We’ll be having one this easter.